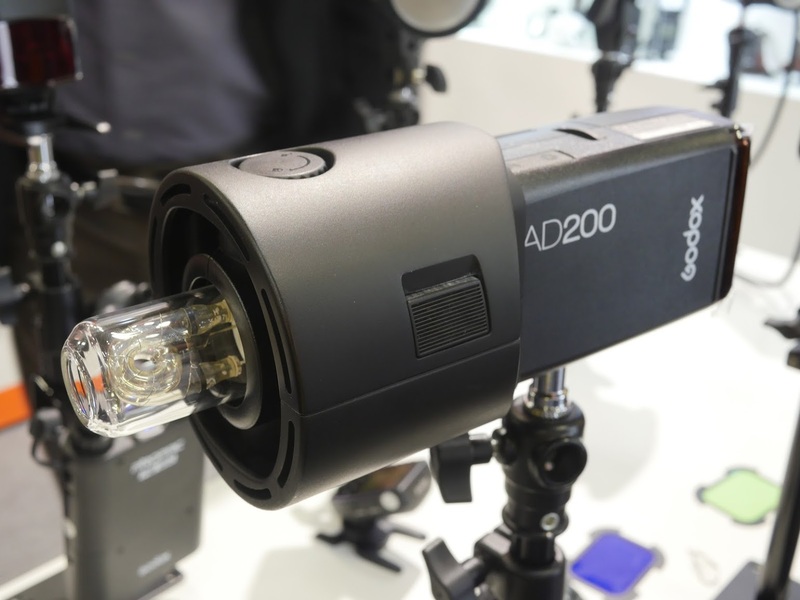 Godox plans to release a hotshoe flash with a circular H200R-style head, lithium battery and built-in radio controls. 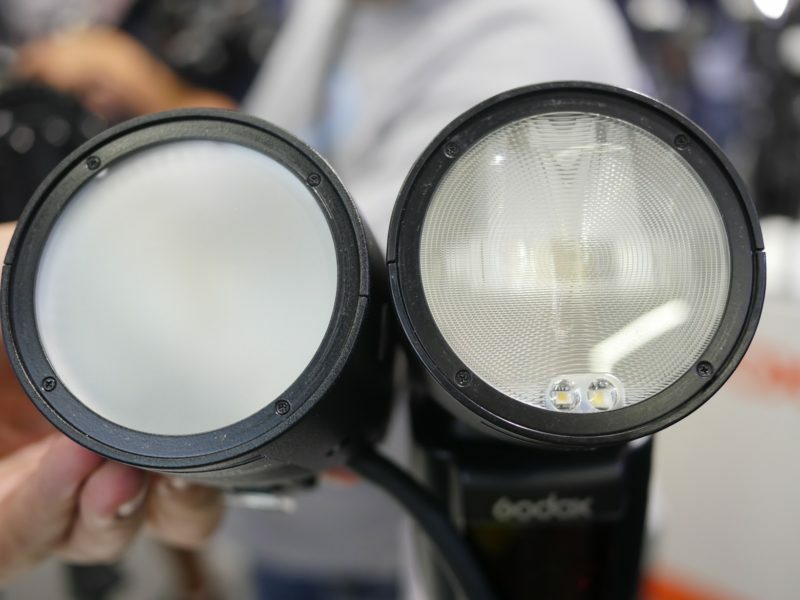 Godox will release a round-headed shoe-mount flash soon. 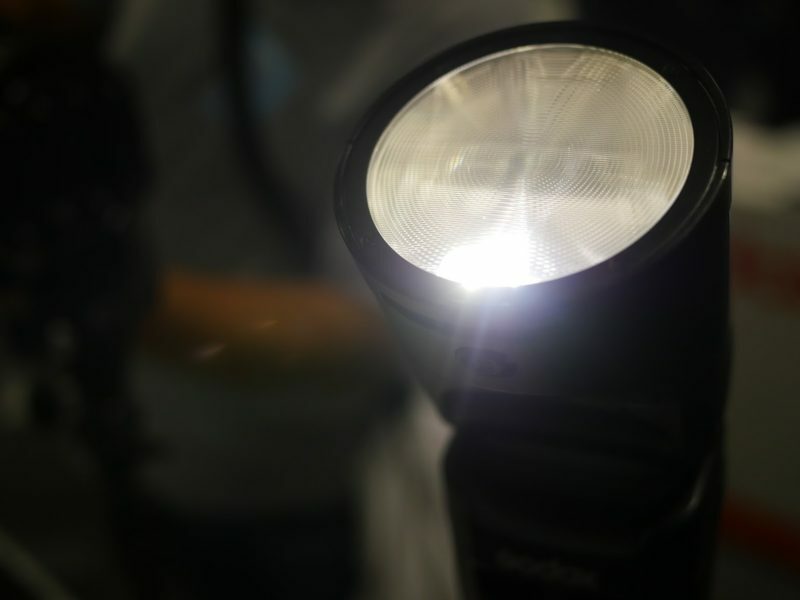 The currently unnamed speedlight (update: “Godox VPro”) is part of an upgrade to the Ving V-series (Flashpoint Zoom Li-ion) of flashes with lithium batteries. The next generation will have new flash bodies, improved batteries and two types of flash head: a standard rectangular one, effectively the Ving V860 Mark III, and a brand new model with a circular fresnel head like the Profoto A1. The manufacturer showed us a working sample unit at Photokina this week. The body looks much like a regular speedlight, with a lithium battery pack and a backlit, monochrome LCD control panel. The head is exactly the same size and shape as the Godox H200R, so you can use all the same accessories and adapters and fit it into a similarly sized slot in your studio case. Unlike the AD200, the new round flash has an electronic zooming fresnel so you can adjust the beam angle. Magnetic add-ons include colour filters, grids, barndoors, snoots, diffusers and reflectors, all part of the AK-R1 accessory kit, which is available for sale now for about $60 (eBay, Adorama, B&H). A two-diode LED modelling lamp lives inside the circular, zooming fresnel head. A little switch under the head turns this continuous lamp on or off. As a Ving flash, there is TTL control, manual power adjustment and 2.4 GHz master and slave functionality as part of the wider Godox X system. A name for the round-headed Godox flash hasn’t been announced yet, nor full technical specifications or price. However we can expect it to have a similar power output to existing products in the Ving V860 series, and therefore about a third as powerful as the Witstro AD200 or AD180. Release date is set for the next few months, before the end of 2018. Pricing we can expect to be somewhere around $200 or so, as that’s the current cost of the Ving V860 II. 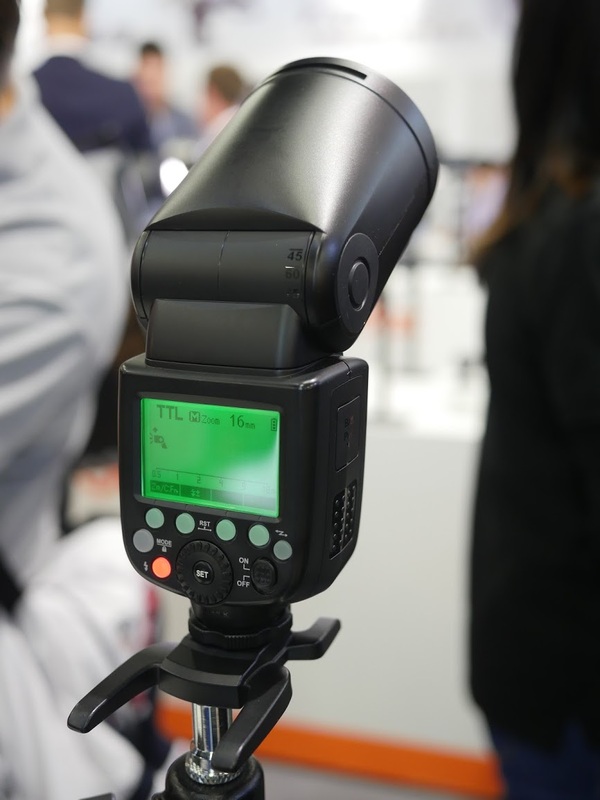 Update (2018-10-13): The working name for the new round flash is the Godox VPro series. Just as the XPro is a “pro” version of the X1 trigger and the AD600Pro is an upgraded AD600 flash, the VPro is a new take on the Ving V-series speedlights. The firm also showed a Profoto accessory adapter for the Witstro AD200. This is a plastic ring in two parts that fit together around the AD200 head, allowing the fitting of Profoto-mount studio light shaping tools. 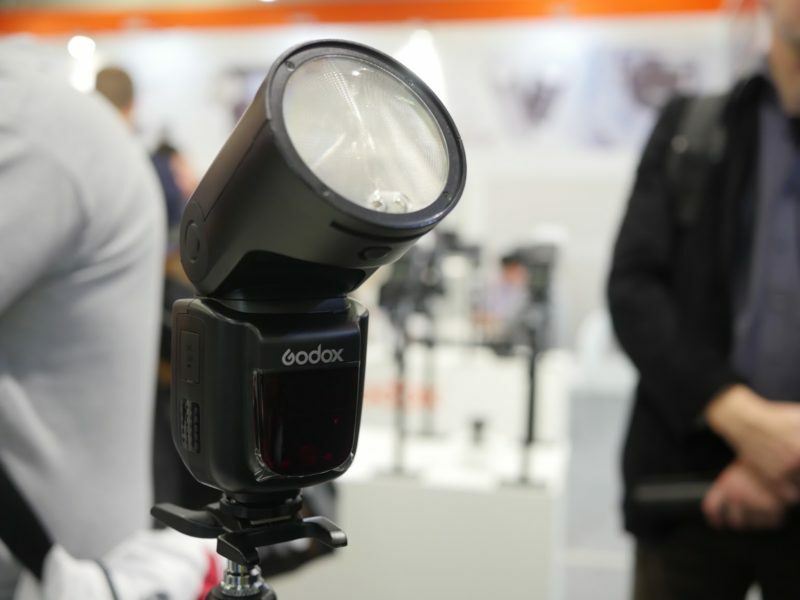 Godox isn’t the only company to have shown a circular-head speedlight at Photokina. Jinbei’s stand, just round the corner, showed off their upcoming HD-2, with a thoroughly A1-inspired design. Is this the start of a new trend? What do you think of these new products? Share your thoughts in the comments below.